The species is distributed in widely distributed in Eurasia. Determination of the subspecies, which inhabits Armenia, requires further taxonomic studies. The Glanville Fritillary widely inhabits the country occurring mostly in humid grasslands and meadows at 1800 to 2700 m a.s.l. The caterpillars are known to grow on various species of Plantago, Veronica, Hieracium, and Centaurea. The species gives one generation per year having butterflies on wing from mid May to late June. 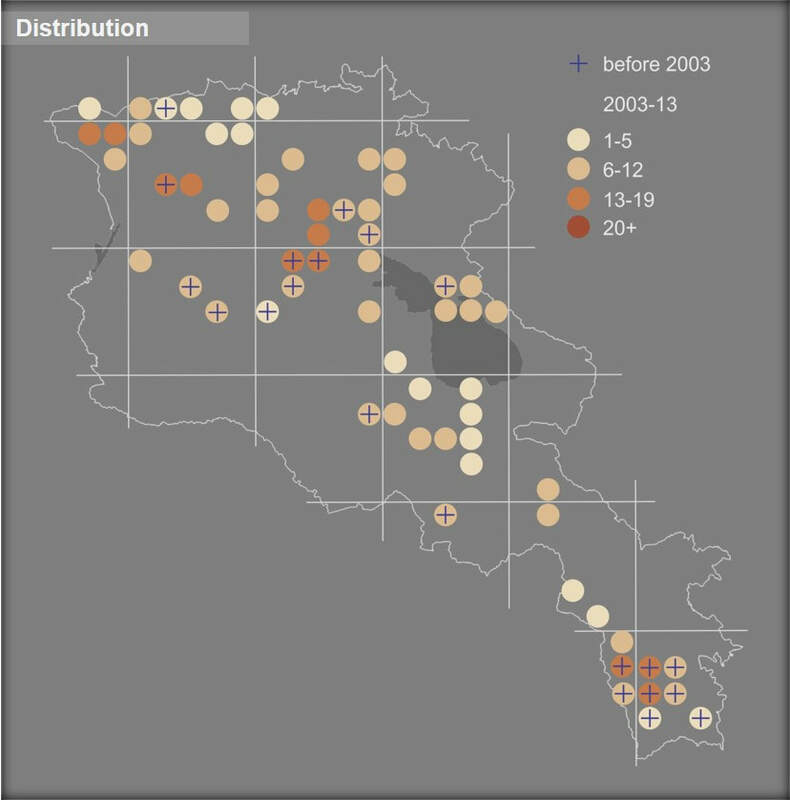 The species is slightly uncommon to rather common within typical habitat, and shows stable population trend in 2003-2013 (p>0.05). However the Glanville Fritillary occurs in lower numbers in degraded habitats, which says that the nomadic grazing could possibly affect the species, if intensified. The species is not included in the Global and National Red Lists, but is evaluated for European one as a Least Concern. Alsoit is not included in CITES and Bern Conventions. 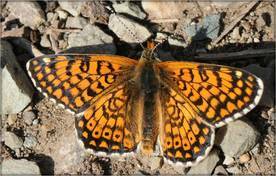 Preliminary assessment of its conservation status for Armenia also suggests it as a Least Concern, although it is suggested to continue its monitoring for further tracking of Glanville Fritillary's possible population changes. The species occurs in number of Protected Areas and Emerald Sites, also it is presented in Lichk, Kajaran, Gyumorats, Gnisheek, Artanish-Shorzha, and Geghadir Prime Butterfly Areas. It appears that there are no specific conservation measures required, however as the species shows certain level of habitat specialization, it is recommended to continue its monitoring to track possible influence of intensive grazing and mowing on its populations. Also it is suggested clarification of intraspecific status of the species.